Buenos Aires, or Buenos Aires Ciudad to set it apart from the even larger metropolitan area, is very much an urban city. Citizens walk a great deal. They take taxis and transit. And in a continuing effort to "green" itself, the City is encouraging portenos to become bike riders too. There are 28 bike stations located throughout the City, with more on the way. 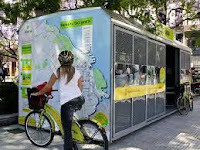 Here a citizen can register and take out a bike, for an hour or so, for free. Repairs are made on the spot by highly trained professionals. Well, maybe not highly trained, but professional, with yellow tees. And helpful. Dedicated bike lanes are being built throughout the City. Some co-exist along wide pedestrian walkways, others are found along streets, and some are being built with barriers to traffic. None of this has prevented motorbike riders from using them, which probably defeats the purpose, and the intended safety value. At present there are 100 km of dedicated bike lanes in BA, with another 100 km in the planning stage. In the City of Richmond, Canada, a city of only 200 000, there are over 60 km of dedicated on- and off-street bike lanes. There are however, no bike lanes in Dawson City.